45RPM black double LP in deluxe gatefold sleeve made of rough-coated reverse-board paper, with printed inner sleeves. SEPTICFLESH are painting an apocalyptic vision and make full use of their impressive musical palette consisting of death metal and orchestral colours on their tenth full-length, 'Codex Omega'. 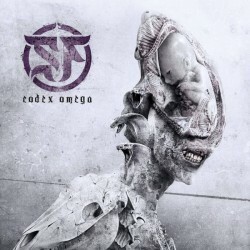 Although the biblical omega marks the end, SEPTICFLESH on the contrary are reaching their current peak with 'Codex Omega', an album that clearly witnesses the Greek visionaries having come to maturity and expert craftsmanship in every sense. SEPTICFLESH are the undisputable masters of symphonic death metal and 'Codex Omega' is the perfect proof for this bold statement.